Maine is one big nature center. With acres of forests, fields, marshland, and stunning coastline, everywhere you look in Maine you’ll see nature at its best. But, if you’re looking for land specifically set aside to protect Maine’s incredible natural ecosystem, we have those too. Located on the coast not far from the L.L. Bean headquarters, Wolfe’s Neck Woods State Park is a popular spot to watch wild osprey and other Maine native wildlife. Sign up for a guided one-hour-long tour with a park ranger or relax by the ocean with a picnic. Named after the pioneering environmentalist, Rachel Carson, the Rachel Carson Wildlife Refuge is headquartered in Wells, but has 11 different land parcels along the coast between Kittery and Cape Elizabeth. The Carson Trail in the Wells location is a beautiful one-mile trail with views of one of southern Maine’s most valuable ecosystems. Open seven days from dawn to dusk, this 224-acre nature park has six miles of trails with loads of flower and tock gardens. The park is a great place to spot birds, dragonflies, and frogs. Check the website for fun events throughout the park. 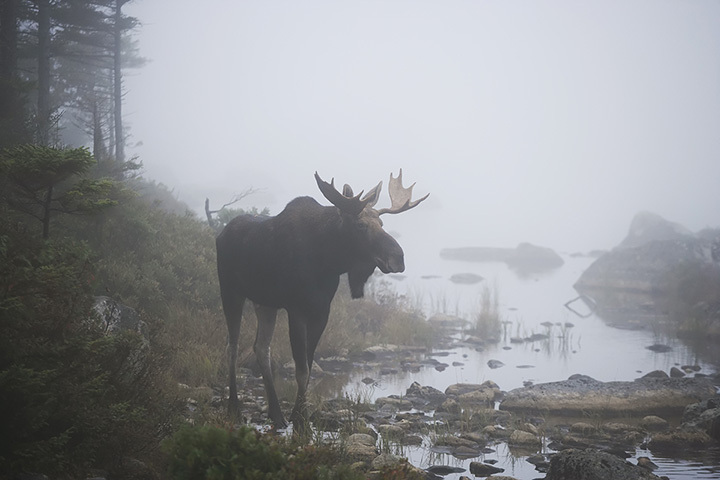 Want to get up close to native Maine wildlife? Head to the Maine Wildlife Park in Gray. For a small fee, you can see rescued moose, black bears, mountain lions, bald eagles, deer, and more. The park is open to the public from mid-April to November. Situated along the Presumpscot River estuary just over the bridge from Portland, this 65-acre sanctuary is home to the Maine Audubon Society. With more than two miles of trails, a salt marsh, meadows, and even an orchard, Gilsland Farm is a peaceful place to spend an afternoon. Moxie Falls is one of the highest waterfalls in Maine. Tourists and locals come from afar to see the thundering falls and swim at the waterhole at the falls’ bottom. Have picnic or enjoy a relaxing walk around the water’s edge. Holbrook Island Sanctuary is a remote coastal nature reserve that offers lots of opportunity to explore and observe a variety of Maine ecosystems from hardwood forests to colorful wildflowers to coastal tidal pools. Located just 10 miles from the University of Maine campus in Orono, this 2,400-acre nature preserve spans the Pushaw and Dead Streams, Lac d’Or lake, and vast wetlands and forests. It’s not uncommon to see river otters, ducks, bald eagles, and moose. The Wells Reserve at Laudholm is a National Estuarine Research Reserve in Wells. Established in 1990, the Wells Reserve protects over 2,200 acres of salt water marsh, freshwater wetlands, beach, dunes, forest, and meadows along the coast of Maine. The Aroostook National Wildlife Refuge was established in 1998 after the Loring Air Force Base in Limestone closed. The refuge is home to 4,900 acres and wonderful hiking trails to enjoy Mother Nature. View more Maine Nature Centers and Botanical Gardens.